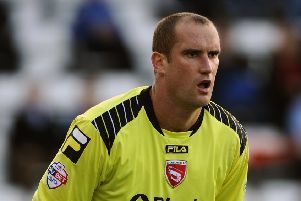 Captain Mark Hughes is the headline name to be released by Morecambe after boss Jim Bentley announced his retained list. The central defender is one of eight players to be leaving the club while Kevin Ellison and Andy Fleming have signed new one-year deals with Fleming’s deal including the option of a second year depending on appearances. Andy Wright, Ryan Williams, Jack Sampson, Declan Watson, Will Bell and Marcus Marshall have also been let go at the end of their contracts. Padraig Amond announced his own departure on Tuesday with Stewart Drummond retiring. Bentley is in negotiations with Andreas Arestidou and Chris Doyle about new deals while it is understood Laurence Wilson and Alan Goodall have triggered another year in their contracts through appearances this season. The Shrimps boss told the club’s official website: “This is always a tough time of the year because you have to make some very difficult decisions and you end up saying goodbye to some players that have done a tremendous job for the club over a couple of seasons. “Everyone that is on that list has contributed to what this team has achieved over the last couple of years.